“Was that a noise? Could someone be in the house?” she asked herself silently. Moving quietly closer to investigate, she stood in the shadows and listened. The clock pendulum. The wind outside. (Maybe even a window gently rattling.) Her heart. But nothing more. 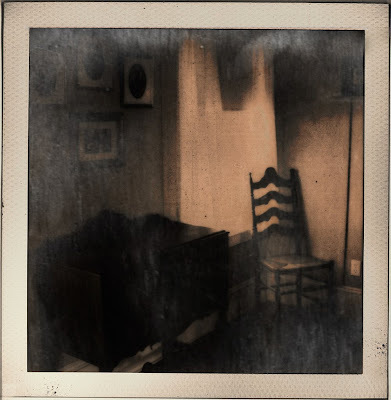 I'm not exactly sure when I first saw Susan Mac's (aka sMacshot) photography, but I was immediately drawn to it. What drew me in was not only the exquisite atmosphere that she creates within her pieces, but also the wonderful stories that she's created that accompany many of them. The above piece is one of my favorites. The short story that goes with this piece humanizes this doll in a way that I can relate to - I have felt this way in my own home when I am there by myself. I'll hear a noise and wonder, "What is that?" This piece, entitled Hush, is part of a wonderful set called Antique Toys. Another set that I really love is called wonder-Land. Because there are so many pieces that I love from this set, it was hard to pick which photo to post...but this one gets me every time and, for me, it captures the eerie feeling that makes up most of the set. There are bits of stories within these pictures, but in looking at them as a set, you begin to see an over-arching story too. Taken mostly at a beach house that she has been going to since childhood, there is a timeless quality to these that I love. Modernity has not touched this house. I love that. Perhaps that's what makes it wonder-Land. Susan is extremely prolific and has many more wonderful images to explore. To see more of her photography, be sure to check out her flickr page. You can also purchase prints (and illustrations!) of Susan's work on her etsy shop and read more about her world and her work on her blog. OH Maura, this is an honor, and you make me look so good! Thanks for sharing her work with me. 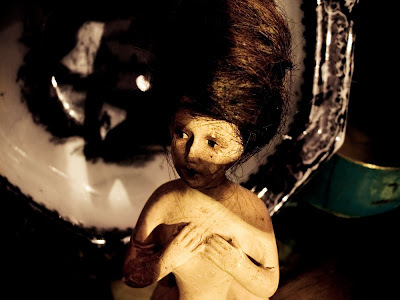 As you could guess, I love her discarded dolls and toys images and the stories. A new fan I will be.